I'v recently stumbled across a fantastic digital archive of Sanborn Fire Insurance Maps. 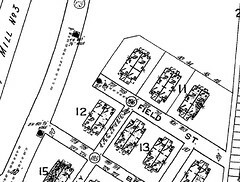 Pictured here is a section of a 1915 map that pictures the historic Stone Hill section of Hampden as well as a part of Chestnut Avenue and Mount Vernon Mill No. 3, now the Mill Center. These maps are really useful for archaeologists of recent history and for anybody interested in historic landscapes because of the detailed information that they provide about buildings (often including what kind of building materials a structure is composed of). At the same time, however they present some mysteries, because they don't tell us much about the people who lived at a site - who lived there, how they made ends meet, their patterns of consumption, and numerous other details. Such mysteries are in themselves a good reason to do archaeology and community history in places like Hampden. The street that is shown as Field St appears to be the alley between Field and Bay Streets. The Field St. houses "face" onto a grassy area that was never paved.